At the start of my research, I thought this would be a relatively straightforward discovery of finding meaning within a word. A direct translation from one word to another to equate to the meaning of an overall text, leading me to a profound understanding of the word “yoga” and all it encapsulates. As a postgraduate literature student, the written word has always been something that has drawn me in; whether by a means of escapism or learning in order to broaden my understanding of life, other people and myself. As a postgrad linguistics student, I should’ve known that the path was never going to be that simple. Throughout this research (3), I have learnt of the layers of translation and interpretation one singular word can have; how a word can differ in interpretation (or translation) based on the general era, culture, and individual experience of the person doing the interpreting. Of course, this sets much difficulty from the outset when aiming to define any word. According to Wikipedia (4), the terminological difference of the words “translation” and “interpretation” occur predominantly in the English language. Translation, supposedly, occurs from the written word from one source language into another. Interpretation is usually based on the spoken word or sign language from its source language into another. The word “translate” comes from the Latin “translat” which means “carried across”. The process of translating words or text from one language into another. The written or spoken rendering of the meaning of a word or text in another language. The conversion of something from one form or medium into another. The process of moving something from one place to another. As you can see from these varying descriptions, the common theme is one of change; changing languages, changing medium, changing places. Does all of this change consequently convert the underlying meaning of the original word/process/form? Is everything that the source language embodies “carried across” into the translated word (6)? The action of explaining the meaning of something. An explanation or way of explaining. A stylistic representation of a creative work or dramatic role. If we forget for a moment that we are focusing on interpretations of different language translations and take a look at a same language interpretation, we are still faced with the difficulty of “layers”: the “middleman”. We all know the game of “chinese whispers” and how one set phrase passed from one person to the next is distorted by the time it reaches the end of the chain. We base what we say to the next person on what we think was said; what we think we heard. Sometimes it comes out as gibberish. Sometimes we overthink and decide on the best sounding sentence: “they couldn’t possibly have said that, they must have said this”. Earlier I referred to an understanding that a translation is based on the written word and an interpretation on oral or sign language. When we think of the “chinese whispers” analogy, we can see why it was so important for the first dictionaries to be written; to try to reduce the misinterpretation of oral tradition, and the various spellings of the same written word, leading to misunderstanding. The word “Sanskrit” is an etymological beauty (10). An overall scholarly agreement seems to be that it derives from the Sanskrit word “samskrta” or “samskrtam”, meaning “put together, well-formed, perfected” (11). Some have even gone so far as to say that it is the language (speech) (12) of the gods (13). One explanation is that it is derived from the conjoining of the prefix ‘sam’ meaning ‘samyak’, which indicates ‘entirely’, and ‘krit’ that implies ‘done’ (14). A “perfect” language that is “entirely done”; it consists of 52 letters in total, 16 vowels and 36 consonants, making the 26 letter English alphabet, morphed from the Anglo-Saxon runic alphabet, seem feeble in comparison! It has been said that these 52 letters have not ever been tweaked or altered, remaining constant from “the beginning”, making it the “perfect language for word formation and pronunciation” (15). W.C. Taylor states that “to acquire the mastery of this language [Sanskrit] is almost a labour of life; its literature seems exhaustless.” (18) How does one acquire the mastery of a “perfect” language, and when translating from Sanskrit to any other language, fully carry over all that the Sanskrit words embody? How long is a piece of string (or thread)? The word “sutra” means “thread”. According to Alistair Shearer, it is a “literary style of extreme brevity”. (19) David Gordon White defines this in more detail in his findings when he explains that the Yoga Sutra consists of 4 verbs only throughout its 196 sutra (aphorisms) (20). Approaching this from an English literature and linguistics perspective, this makes the text exceptionally repetitive and also makes us question the variety of verbs used in its numerous interpretations. Despite the original’s “extreme brevity”, it would appear that the translations and interpretations of the text are the complete opposite in length and flowery language. Is this simply because the translated language doesn’t have the “perfection” of the Sanskrit? Is it because the translation into English isn’t “entirely done” and requires further commentary? Copywriting is a style of writing linked to the advertising industry (22). It is a skill set that the previous owner and copywriter of international agency, J. Walter Thompson, explained to me as “being able to put your point across in as few words as possible, whilst gaining the required effect (23)”. In a sense, it is similar to Shearer’s description of unravelling the thread. The few words used in a headline should attract your target audience, either teach or inform them of something, induce an emotive reaction, consequently manipulating them to buy a product or service or donate to a charitable cause (subject to the brief). A good advertising headline shouldn’t have to be explained with an additional commentary. It says everything it needs to say in its few simple words. Patanjali’s original Sanskrit is not accompanied with an explanation of what he is saying. The sutra are all he needs to say. What, then, compels future translations and interpretations to be so descriptive in meaning? Advertising is a modern (25) day concept originating in the 1920s, and subsequently aspires to the modern day audience. When Patanjali wrote the sutra, perhaps the majority of his audience understood what he meant so there was little need for explanation. Meanings of the same English word can change dramatically over time and more words are added regularly, with dialects and cultures influencing the language (which is why we have to release a new dictionary every year or so) (26). However, as Sanskrit is the “perfect” language it is, with a formula that has never been “tweaked” or “altered”, does this imply that the meanings of the words haven’t changed over time? In which case, the meanings of the words in Patanjali’s era would be the same in every era, right? Concentrate separately on the word, the meaning and the object, which are mixed up in common usage; understand the speech of every creature. Samyama on the interactions between languages, ideas, and object is to examine the individual features of the objects, the means of describing them, and the ideas and their cultural influences in the minds of their describers. Through this, one can find the most accurate and effective way of communication regardless of linguistic, cultural, and other barriers. Despite these two translations being very different in wording, the underlying message appears to be the same. Words/languages, meaning/ideas and objects are distorted within the mind of an individual based on the individual’s thought processes of memory and imagination, and their perception of reality. A basic example of this is with the word “dog”. We all understand that it is a mammal with four legs and a tail (in its most simplistic form). However, one person who has grown up with a dog as a loving household pet will conjure feelings of love, ideas of comfort and softness based on this one word. Whilst another person who has been bitten by a dog as a child, let’s say, and never created a bond with any other dog since, will conjure up feelings of fear, ideas of aggression and viciousness. Within these personal experiences will also be layers of cultural influence, for example, the English culture do not use dogs as food, whereas certain Chinese cultures do, affecting any type of emotional attachment to the object of the word. There may also be layers of generational influence (possibly within the same culture), for example, an English person may have grown up with working or hunting dogs, which was considered the norm of that time, whereas another is of the age where animal cruelty and animal rights are of great importance. A simple 3-letter word can conjure up an array of meaning, whether that’s the individual receiving it (through hearing or reading), or the person delivering it (through speech (oral or sign) or writing). 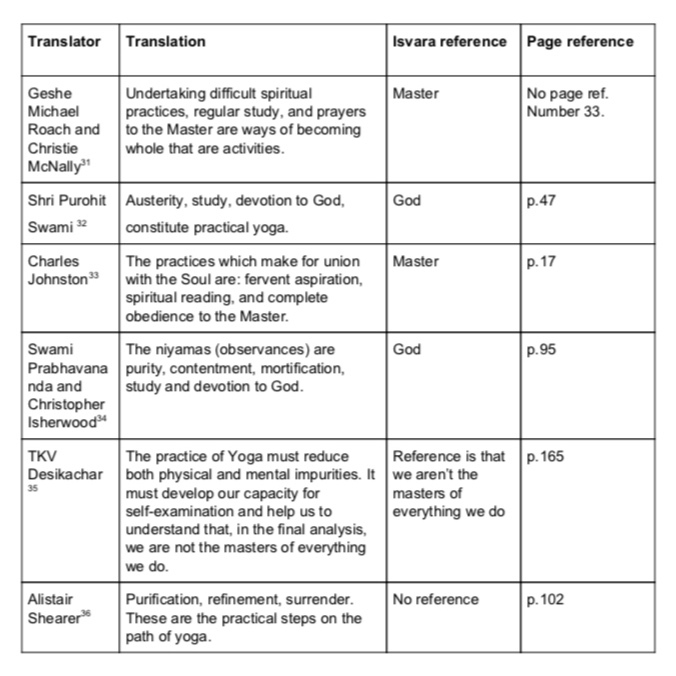 There are many examples of this type of translation and interpretation discrepancy in the Yoga Sutra translations. For example, sutra 2.1 (30) and the translation of the Sanskrit word “Isvara”. As you can clearly see from the table, sutra 2.1 has been translated and interpreted into various sentences, and these are but a few of them. The interpretations referenced above take the word “isvara” to mean either “God” or “Master” or nothing at all. The words “God” and “Master” in and of themselves have many layers of interpretation based on spiritual, cultural, historical and personal context. They could mean an omnipotent yet external being; an omnipotent yet internal being; an omnipotent spirit; a collective unconscious; a spiritual human guide of yoga; a human guide to our own psychologies; a guide within the foundations of nature and all that it embodies; energy fields etc. The fact that Shearer and Desikachar (37) deviate away from even translating the word is a powerful “interpretation” of the word itself and a reflection of their own personal journeys at the time. In general, what I have discovered is that humans will (consciously or not) manipulate a translation, or interpretation, of a text to validate a belief they already hold in the first place. As mentioned in the introduction to this essay, humans will take a “thread” and unravel it to validate their own views and requirements of their own self in that current moment of translation (38). Isn’t this entire exercise something that Patanjali made clear about us being aware of as a part of his Sutra (39)? Initially, I took this quotation to mean that we should know more about the writer of the words; they are the thinker behind the thoughts. There is much dispute around who Patanjali was. Without being able to know the man (we assume) behind the written words, can we ever really know the true meaning of his words? Various scholars believe that Patanjali could be several different authors (41). Some believe that he is the same author of at least 3 different texts but as White points out in his research (42), there is too much of a timescale between these texts in order for it to be possible. Despite the confusion over author/narrator, the more I delved into the different translations of the Yoga Sutra, the more I’ve come to the opinion that the thoughts and the thinker are not the writer but the reader themselves. Or both, as that is indeed a possibility. In the process of translation, we can see more clearly the thoughts of the reader, the interpreter. The thoughts are our own threads to unravel and to give us a greater understanding of ourselves. By reading other interpretations, we can see other thoughts unravel and consequently, understand others more in the process (43). If we are to believe the translations of Patanjali’s Sutra to be factual, then “his” chapter 3 covers this in great detail. In his essay, The Power and Importance of Words, David L Brown states that “t here is nothing pure or sacred about the written word, for words are only the expressions of human beings.” (44) At the start of my research, I agreed with this. Why do they have so much weight? But on second thought, it is because they are the expressions of human beings that makes them sacred. Perhaps not pure (45) due to layers of “mind stuff”, but sacred in the sense that they can be unravelled so deeply to expose the individual human psyche. Even if the translations of the Yoga Sutra are a modification of the mind: correct or false understanding, imagination, sleep, or memory (46); they are still a reflection of our “self” in that current moment. They may contain many layers but that in itself can be used as a mirror to learn from, to draw understanding from and to see what requires untangling. The beginning of abstract thinking, such as that within the Yoga Sutra, and the need to find an understanding of life as we know it can only have started with the word, and language. (50). Without words, we are left with a purely sensory existence; thoughts and memories are of a tactual nature (51). Life would be lived based on neurological pathways created by experience within the body only. The mind would most likely not get involved as much as it does with language. There would be no concept of “suffering” as there would be no word for this and all that the word embodies on any level. It would simply be a state of being, an experience, that would then be replaced by another state of being, and another, and so on. Humans, with words, have a need to find an answer to existence and a way to exist with limited suffering, which is clear from the many translations of the Yoga Sutra of Patanjali. If this means that we will over analyse texts that are ultimately the thoughts/experience of one or several person(s) then we will, as by doing so we create meaning to our lives and a means of distraction from the everyday suffering of existence (52). The paradox of the word, (and the Yoga Sutra) is that they may tangle us up even further in our own minds and create more suffering and confusion around the meaning of existence. But in order for something to be untangled, it has to be tangled first. The Yoga Sutra, and any words, lead us to a closer understanding of ourselves and each other, which opens the mind, and our existence, to all perceptions of reality. Anything can be understood. With each attempt, fresh and spontaneous understanding arises (53). As the Upanishads state, “words are weariness” (55), but only if we get caught in the tangled thread and allow it to be a distraction from our personal experience and growth. An individual cannot translate the Yoga Sutra once within a lifetime and then be done with it. Used as a means of disentanglement, this repeated translation exercise will act as an insight into one’s own mind and yoga journey. It will enable us to be a part of another’s’ journey, maintaining connection and authoritative experience. 1 Genesis 1.1. Was this the beginning though? Words, language, weren’t in existence “at the beginning” which adds even more weight to this sentence. Words are considered the beginning of life as we know it, for many a human. But why? 2 This will be explained throughout the essay. 3 In reference to this particular essay, which has been far too short (!) and there is so much more to discover - whether or not it would be of any substantial use to my concluding argument. 4 A very substantial and respectable source! 6 Here it is important to note that my research has been into English-only translations of Patanjali’s Yoga Sutra. There isn’t enough word count for other languages but I believe my overall conclusion would remain the same. 9 But I want to open the can... : an example of this can be found on p132 of the 1923, A Sanskrit-English Dictionary by Arthur A. MacDonnel. “Dhâr-anâ” is translated to mean “wearing (a dress); supporting, assistance; repression; mental retention; memory; mental concentration, suspension of the breath, immovable abstraction; settled rule; understanding.” The English difference between “wearing a dress” and “supporting” and “repression” are obviously very extreme! What about “context” I hear you cry? If all words can have varying translations such as this, then how can we ever be truly sure of the original context in an ancient source language? 10 My opinion only. See footnote 12. 12 My personal understanding of the etymology of the word “sanskrit”, and using my own experience / knowledge without any further research, was to break it down as “sans” and “krit”; “sans” in French to mean “without” and then “krit” made me think of “write” or “ecrit” which is a French subjugation of the verb “ecrire” meaning “to write”. “Without writing”. Was Sanskrit actually meant to be a language that wasn’t ever written? Weren’t all languages originally? What is lost when we translate the oral word to the written word? 17 “In the beginning was the word...” see initial footnote...or was it? 19 P.20 - see references for publication details. 20 P.10 of Princeton University Press 2014 edition. 22 An industry in which I have worked for almost 10 years. 23 The irony of this was that he had to explain it in several words to me. 24 Ch 5 in David Gordon White’s “The Yoga Sutra of Patanjali”. This is something to be explored in more detail but not for this essay unfortunately! Was this an intentional entangling on Patanjali’s part? A part of the process, perhaps? 25 Whenever I state the word “modern”, I’m usually referring to the past couple of millennia. 26 Ch2 Dr Johnson’s Big Idea, in “Balderdash & Piffle; English Words and their Curious Origins” by Alex Games, 2006. 37 Noted that he uses the word “masters” but in an entirely different context to the other interpretations. 38 Is this not what I’m doing now?! 39 Here I refer you back to sutra 3.17 and sutra 1.6 and 1.7 “Ptatyaksa-Anuman-Agamah-Pramanani”: the five modifications of the mind. 40 An interpreted / translated quote from Kaushitaki Upanishads. 42 p.35-3643 Sutra 3.43 perhaps? 47 With this phrase, there is my underlying tone of cynicism and consequently a need to use this as a reference to support my commentary....have I chosen certain elements in order to provide evidence for my current understanding and overall conclusion of this essay?